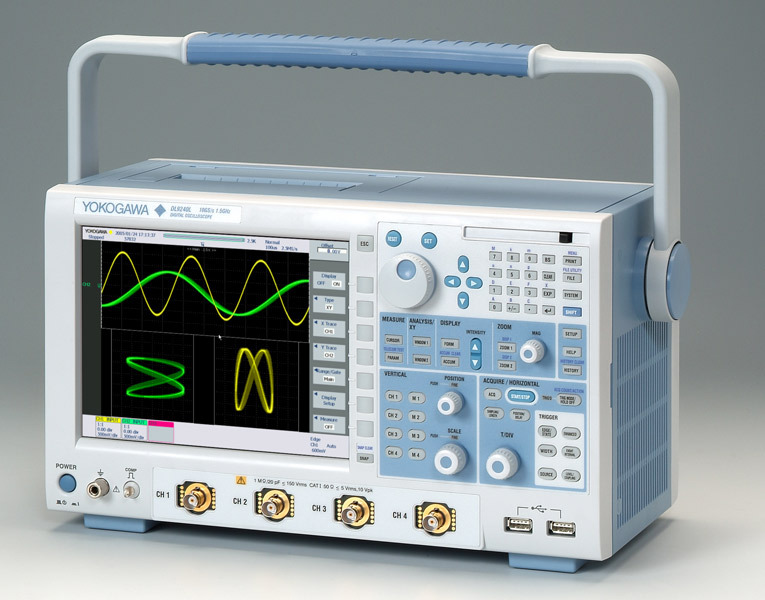 Winner of Test & Measurement World's "Best in Test" award, the DL9000 offers you the strongest combination of performance, ease of use, and value among digital oscilloscopes in the 500 MHz to 1.5 GHz range. It contains a wide array of analysis functions that include parameter statistics, trends, real time filters, serial bus analysis and power analysis. The standard DL9000 series is equipped with 2.5 M word/ch record length, dot density display technology and a wide variety of analysis and trigger functions. For full 1 GHz/1.5 GHz BW measurements, optional 2.5 GHz active probes are available. These make the DL9000 series the most affordable 500 MHz/1 GHz/1.5 GHz measurement system available today. Fast signal acquisition helps you avoid missing anomalies. However, simple superimposed waveform displays only tell whether or not an anomaly occurred. Such displays do not provide information about when the anomaly occurred, what events occurred before the anomaly, nor what happened after the anomaly. 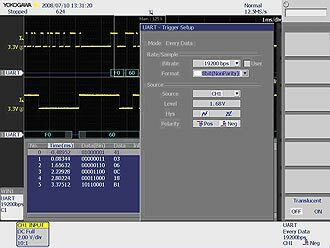 The DL9000's History memory function allows you to view and analyze up to 2000 previously acquired waveforms, even after the acquisition stops. This offers unparalleled insight into waveform behavior and makes troubleshooting easier. History memory captures and saves waveforms before and after the anomaly; thus providing insight into the cause and effect of the anomaly. 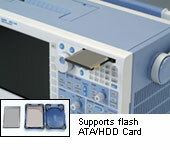 The DL9000 series can be configured without the optional internal HDD. For units without the HDD, it is both easy and fast to securely erase all the data in the unit. Therefore, you do not have to worry about your confidential test results being transferred to a different location, along with the unit. The DL9000 is only 35 cm wide and 18 cm deep so it does not take up all your valuable bench space. And it weighs only 6.5 kg so it is easy to move from one bench to another. 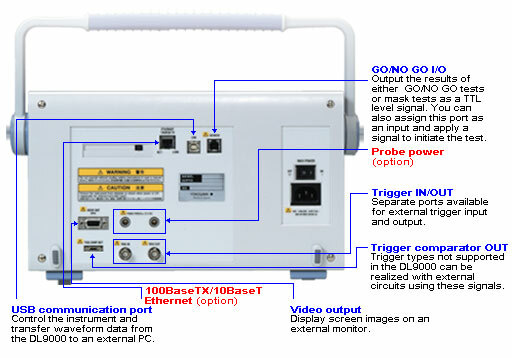 The DL9000 signalXplorer is Yokogawa's 10(X)th generation digital oscilloscope. It allows users to select the most appropriate memory setting for a given measurement and then acquires and displays long and short memory records quickly, saving the waveforms to its segmented memory. Advanced memory handling ensures that you get all the benefits of a long memory scope regardless of the record size you allocate for each acquisition. This is made possible by the state-of-the-art ADSE (advanced data stream engine) ASIC. Example of shorter memory acquisitions (I2C SDA signal capture): by skipping portions of a signal which contain no information, many frames can be acquired in the memory. Mega word signal capture example (TV composite signal): 1 whole TV frame can be captured without losing detail. When acquisition stops and there are more than two acquisitions in memory, the HISTORY key is illuminated. At that time, you can use the rotary knob to view every single acquisition in memory, one-by-one, and look for an anomaly. The new History Replay function allows you to play back the waveforms in memory in the same way you play back video on a DVR. When you need to observe closely-spaced waveform events consecutively, it is important to minimize the dead time between captures. The 'N single' mode on the DL9000 captures up to 1,600 waveforms on each of 4 channels with as little as 400 ns of dead time between acquisitions. 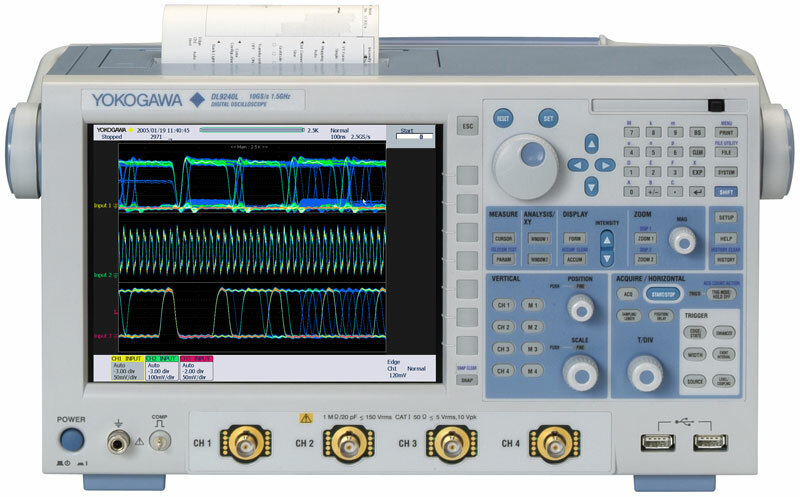 In the 500 ps/div range, this corresponds to an effective acquisition rate of 2.5 M waveforms/sec/ch. When observing long-term repetitive waveform events, the ACCUM function offers a fast repetitive signal acquisition rate of up to 25 k waveforms/sec/ch (on 4 channels simultaneously) while retaining up to 2,000 acquisitions in memory. Whether you use N single or the ACCUM function, previously acquired waveforms are stored in memory and can be accessed using the History Function. Both Zoom search and History search functions are available in the signalXplorer. Zoom search locates an area of interest in a single acquisition. History search locates any acquisition in history memory that meet user-selected criteria. The intensity of individual display pixels are varied depending on how often a signal illuminates each pixel. Even for single shot acquisitions, Dot Density Display provides visual information about the S/N ratio of a signal. For repetitive signal acquisitions, this feature offers additional insight into the frequency of occurrence of portions of a signal over time. 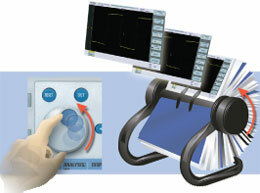 In short, Dot Density Display technology offers analog oscilloscope-like waveform representations on a digital scope. Gain new perspectives on your waveforms by using time and voltage histograms. For example, signal jitter can be shown using a time histogram, and noise on DC signals can be visualized using a voltage histogram. Use the statistics functions to generate statistical information (max, min, avg, std dev, etc.) about waveform parameters. Continuous statistics (running statistics on selected parameters during acquisition), Cycle statistics (statistical information about a waveform on a cycle-by-cycle basis) and History statistics (statistics on waveforms captured in history memory) are all available. 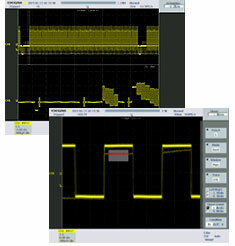 The DL9000 series can calculate FFT waveforms using up to 250 k points. To scale the results, you can specify the center frequency and the frequency span, just like you would do with a spectrum analyzer. 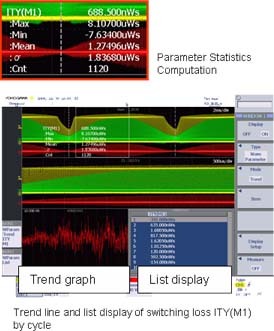 Track long-term waveform parameter trends using the trend display. The Trend display can be used to visualize fluctuations of a selected parameter. With free Mask Editor Software, you can define a mask and then test to see whether or not the measured signal falls in/out of the mask. Masks for a variety of communication signals can be defined. Define up to 8 math traces. Functions include: filtering, +, -, x, Integration, Edge Count and Rotary Count. Basic arithmetic functions are performed using the ADSE (hardware) and results are displayed in real time. Real-time filtering 200 MHz and 20 MHz analog low pass filters and 8 MHz, 4 MHz, 2 MHz, 1 MHz, 500 kHz, 250 kHz, 125 kHz, 62.5 kHz, 32 kHz, 16 kHz and 8 kHz digital low pass filters are available for real-time filtering. These filters can be applied to live signals without slowing down the signal acquisition rate. Additional types of digital filtering are available using the math function. 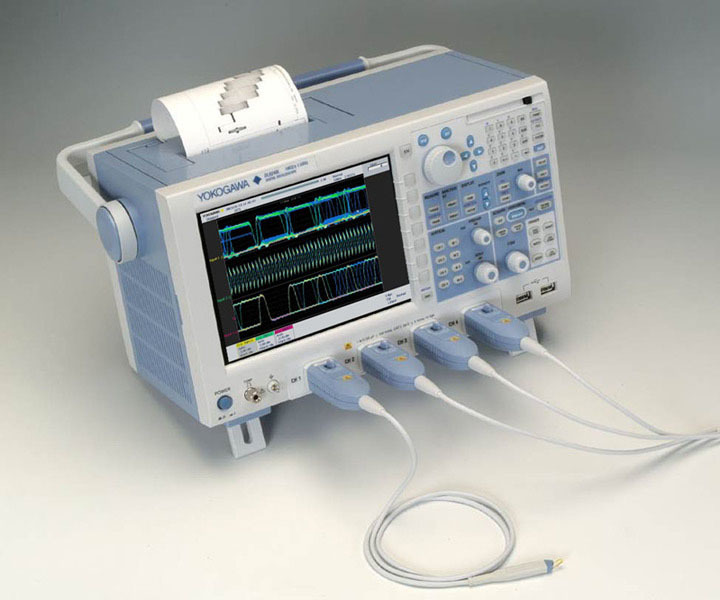 Use USB 2.0 interface (standard), 100BaseTX /10BaseT (option), or GPIB (available using a National Instruments NI PCMCIA-GPIB card) to remotely control the DL9000 and to transfer waveform data from the scope. The industry standard USBTMC-USB488 with USB 2.0 interface offers data transfer rates that exceed typical GPIB data transfer rates. Use popular, widely available, large capacity media such as CompactFlash or USB HDD to save and transfer waveform data captured with the DL9000. 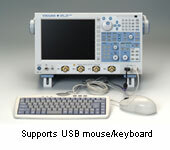 A USB mouse and/or keyboard can be used to facilitate operation of the unit. The front USB port can also be used to connect to a USB printer. Dedicated triggers for CAN Version 2.0A/B (high speed and low-speed CAN bus signals; used extensively for the internal busses of automobiles, factory automation equipment, medical devices, and other application) and CAN bus signal protocol analysis function are available as an option on any DL9000 series instrument. A number of triggers and powerful analysis function for CAN bus come together in a instrument. 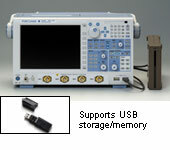 Two models of differential probes are available for CAN measurements (sold separately). The DL9000 applies triggers based on a variety of specified conditions, enabling reliable capture of only the desired CAN bus signals. It offers Start of Frame, ID, and Data conditions, combinations of these conditions, and Remote Frame and even set up to four CAN ID/Data conditions, combined with OR logic, and trigger if any of the conditions occur. You can also set conditions relative to a specified trigger Data value such as True/False, Greater than/Less than Data value, between two(2) data values, or out of Data range. Triggers can be activated on combinations of CAN and analog signal trigger conditions. 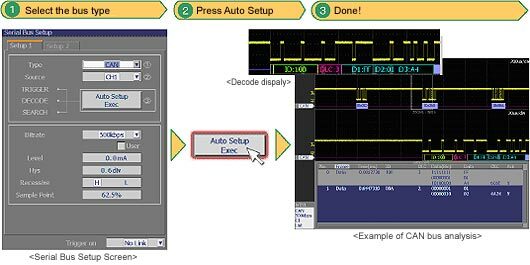 For example, you can debug a system by setting up a condition in which the trigger activates on a time difference between a CAN signal trigger condition and a signal input to another channel such as a sensor or actuator operation signal. You can set a condition in which a trigger activates on the time difference (delay time, etc.) between trigger conditions set on two separate CAN networks. This is useful for verifying the complementary operation of two corresponding CAN sub-networks. The CAN bus protocol analysis results list can be displayed while the waveforms are being acquired. Analysis results of frame type, time from trigger position, ID, DLC, Data, and CRC, and Ack/Non-Ack are aligned in a single screen with their corresponding waveforms, enabling you to easily compare waveform quality and bus protocol together. You can capture waveforms and analyze the data in real time at update rates of approximately fifteen times per second. * You can save the analysis results (list) to a text file in CSV format. * During continuous measurement at 5 ms/div and a record length of 1.25MW. You can analyze two CAN bus signals simultaneously and display the results. For example, you can check waveforms and protocol data from two CAN sub-networks with different condition at the same time, and verify the correlation between the signals. You can perform searches of the captured data by specifying Start of Frame, ID, and Data condition (or combinations of these), and Remote Frame and Error Frame conditions. When the frames are detected that match the search criteria, the analysis list is highlighted and that portion of the waveform is displayed in the zoom window. You can identify portions of the waveform such as the ID or Data field of a specific frame and display those in the zoom area (Field Jump function). Using the Auto setup function dedicated for serial buses, you can have the instrument automatically enter settings for record length, time axis (T/div), triggers, and analysis by simply specifying bus type and source (input) channel. After that, it will automatically display bus waveforms and analysis results (list and decoding). This frees you from tedious analysis setup. DL9000 Series can perform I²C, SPI, UART, LIN and CAN bus analysis with the different available options (/F5, /F7 and /F8). Triggers for these bus types are standard features. 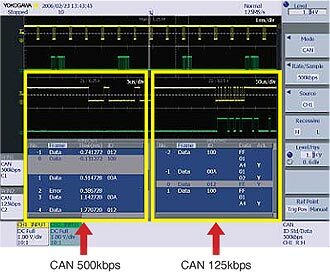 These functions make it easy to discriminate between partial software failures and physical-layer waveform problems when troubleshooting systems by observing the physical-layer characteristics of signals. 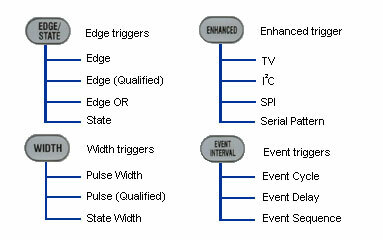 A wide range of trigger conditions can be set, including triggers based on ID-Data combinations and combinations of a serial bus trigger and a regular edge trigger. 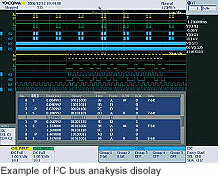 DL9000 Series displays protocol analysis results while bus signals are being captured. With the Dual-window Zoom function, DL9000 Series can simultaneously analyze and display the waveform of buses running at different speeds. Analysis results can be displayed not only in a list, but also shown as a decode next to the waveform. *: CAN trigger and CAN analysis is supported by the analog input channels. 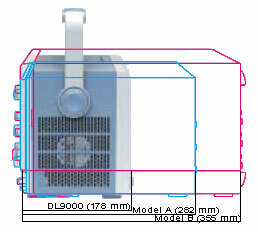 DL9000 Series is equipped with dedicated CAN triggers including Start of Frame, ID, Data, Remote Frame, and Error Frame. Additionally, you can now set up to four ID and Data combination bit conditions and activate triggers based on OR relationships of these combinations. With the protocol analysis results list which is shown in a time series fashion, you can check each frame's analysis results (frame type, time from trigger point, ID, DLC, Data, and CRC), presence/absence of Ack, and the association with corresponding waveforms in a single screen. You can specify the type and other characteristics of fields and frames and search for corresponding waveforms in the captured CAN frame data. 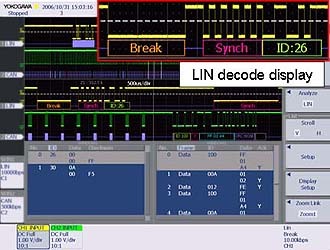 Triggering and analysis functions for LIN bus (widely used as an in-vehicle LAN protocol for car body applications) are available on the DL9000 Series. It is equipped with Break + Synch trigger. You can check waveforms and the protocol analysis results (list) along with the error information (Parity, CheckSum, TimeOut, etc.). 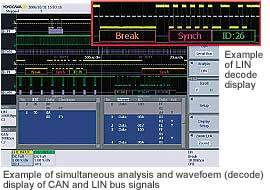 You can analyze both LIN revision 1.3 and 2.0 conformity data existing on the same bus line simultaneously. * LIN bus analysis function supported with firmware version 2.40 or later (/F7 or /F8 option). serial data bus signals. Observing the physical signals of these buses allows you to more effectively separate hardware related problems from software related problems. With the new firmware version 4.42 or later, the SPI analysis function without CS(Chip Select) source assignment is available. 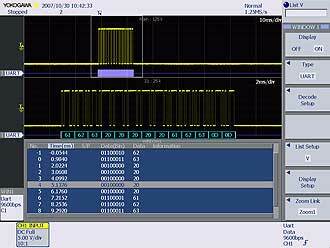 Some SPI bus applications do not require CS signal. Also, the data field size and the enabled bit range for analysis can be specified. The DL9000 DSO series can be applied for more wide-ranging SPI application. General-purpose UART trigger and analysis can be supported. The UART trigger function can trigger on stop bit of each data frame. Analysis number, time from trigger position, binary and hexadecimal notation of data, errors, and other added information can be linked with the waveforms and displayed in the same screen as analysis results. The UART analysis results can also be displayed in ASCII. 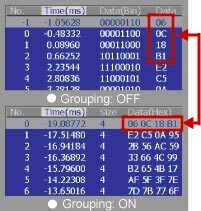 Grouping display is supported for easy identification of serial messages over 2 bytes. This built-in thermal paper printer provides a convenient way to print out what is shown on the DL9000's display. Note: You do not need this option to power the 2.5 GHz active probe (PBA2500). Simply select voltage and current channels in a dedicated setup menu to add power-specific parameters to the waveform parameters of the selected channels. See the specifications on the reverse side of this leaflet for the dedicated parameters (types) that are added. You can also calculate the Joule-integral (I²t) required for fuse characterization. For example, in a active power factor correction circuit running in critical conduction mode, fluctuations in the switching frequency and switching current of the modulating signal, relative to the input voltage of the commercial power supply, can be displayed simultaneously along with the input voltage waveform. 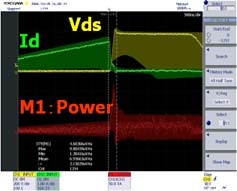 The figure on the left shows data from multiple cycles of voltage (Vds), current (Id) and the computed switching loss (Vds x Id) (M1 waveform). Loss can be calculated for each cycle within a specified range of the M1 waveform (the Iteg TY parameter), and the integrated value can be quickly computed. The DL9000 also lets you view cycle-by-cycle switching loss in a list or as a trend line. Variations between power on and steady operation can easily be seen. With high speed acquisition (max. 2.5 million waveforms/sec.) and the history statistics function, you can compute statistical values and total loss of the switching loss waveforms across multiple intervals. By specifying a computation range, you can also compute the loss when switching ON and OFF, separately. The number of history waveforms (Cnt = number of switching cycles) and their statistical computation results are displayed in the figure to the right. The difference in the current probe and voltage probe signal propagation time (skew) can be automatically corrected. This is useful for accurate measurement and computation of switching loss. A deskew correction signal source (model 701935, sold separately) is available. 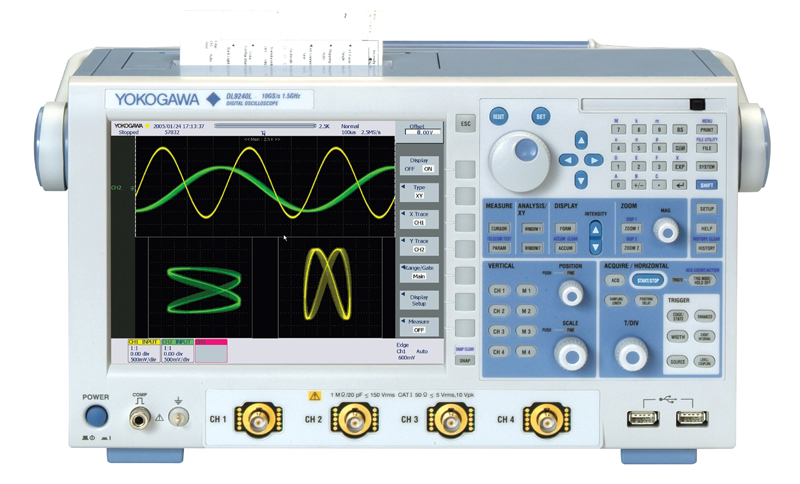 Quickly perform waveform computations of active power, impedance, and Joule-integral (I²t), and display the resulting waveforms. 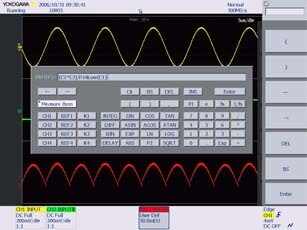 Simply select the desired function and source input channels from the menu to display the computed waveform. Harmonics generated by the target device under test are compared to the harmonic values allowed in by the IEC standard, based on the applicable class of device (classes A-D). Bar graphs and lists can be displayed for comparing the harmonic limit levels and the actual measured harmonic levels. Measured harmonic levels exceeding the specified limit are highlighted for easy identification. Four user-defined waveforms can be defined (MATH1-MATH4) and used simultaneously in computations. In addition to a wealth of computation functions, twenty-six measurement parameters can be used in the equations. For example, you can normalize data using the amplitude of a measurement parameter. Up to 6.25 MWords per channel can be computed. Math waveforms can also be used in X-Y graphs, FFT displays, histogram analysis, and other functions. 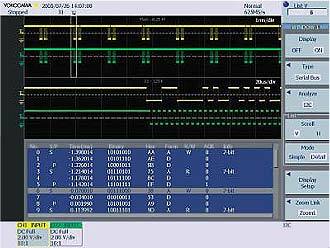 LXI (Lan eXtensions for Instrumentation) is a communication platform for test & measurement instruments, built on LAN technology. It provides improved transfer speeds with improved usability and low cost, when compared to traditional instrument interfaces. It's easy to migrate over from traditional GPIB system, because LXI utilizes existing technologies such as VXI-11 or IVI. 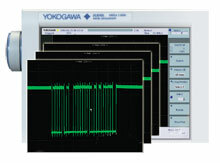 The Yokogawa DL9000/DL9700/9500 series and SB5000, with the LXI compliant Ethernet option (/C12) installed, are fully compliant with LXI Class C.
Currently, over 20 test and measurement manufacturers provide LXI compliant products, and the total number of supported products is above 1100. As a new communication platform for applications requiring high transfer speed, low cost and usability, LXI will become more widespread in the future. For more information on LXI, please visit the LXI Consortium.